No sooner had we settled into our berth in Shelter Bay than it was time to take the old girl over to the travel hoist for her lift-out. 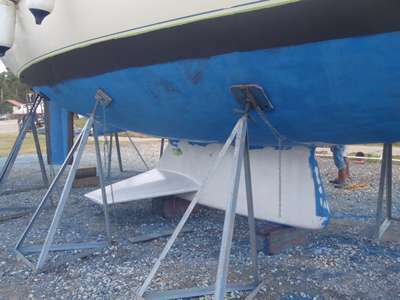 Her bottom was scrubbed and a new epoxy layer painted onto her keel where it was damaged by fishing nets and scrapes along the putty. 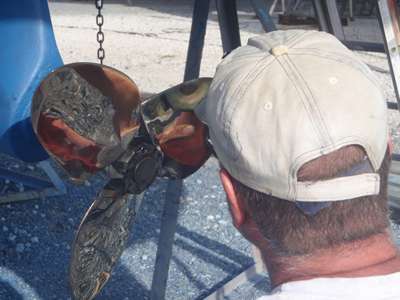 She was given a couple of coats of antifoul, and her propeller given some attention. We had been having trouble getting the throttle out of reverse after feathering the prop, and now we knew why – one of the blades was jammed fast meaning that the prop could not feather. (To avoid a long & boring explanation of this, non-sailing friends should google ‘feathering prop’ if you are in any way interested!) It seems that there was some heat damage (the welding expanded the hole where one of the blades rotated) following the welding done to it in Grenada. Luckily Steve was able to find someone with a small grinder to return the offending hole to its correct circular shape and the blade fits once more. The rudder stock also needed some attention as it had been letting in water, and again with some help and advice Steve was able to sort it himself. Shelter Bay has haul out facilities, but it does not have much in the way of skilled engineers. Nor is it easy to get any spare parts or materials to do jobs. Ordering them in from abroad is also fraught with problems, and if/when they do finally arrive you are charged more than the original shipping costs to have them delivered from Panama City. So not quite the yachting centre we were expecting. So, after a week on dry land, she is back in the water looking pretty good. Unfortunately we have not been able to source a replacement portlight, but are in touch with Gebo in Holland who have a replacement glass for the window on order (actually its acrylic, not glass. )They say it should be with us in 2-3 weeks. 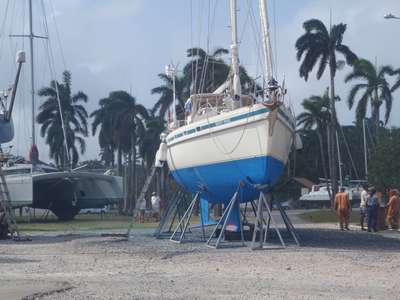 Scott-Free on the hard at Shelter Bay Marina, Colon. Fresh epoxy to cover scrapes on the keel. 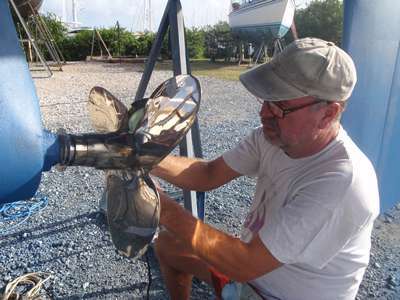 Steve polishing the mended prop. Shiny enough to see your face in!